Although I have not been posting to my blog lately, I have been busy. 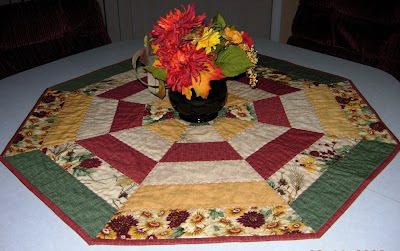 I finished a fall table topper for my mom. We purchased these fabrics at an Oregon Wal-Mart this summer. I have enough fabric to make myself one of these toppers as well. I have only finished one so far and that one is currently on the table in my mother’s kitchen. Maybe I will have mine done for next year. 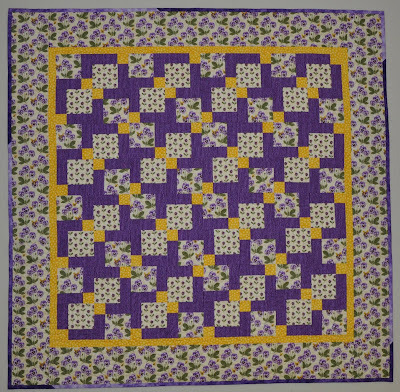 I have been busy quilting customer quilts and it seems that I don’t get an opportunity to work on quilting my own tops much. 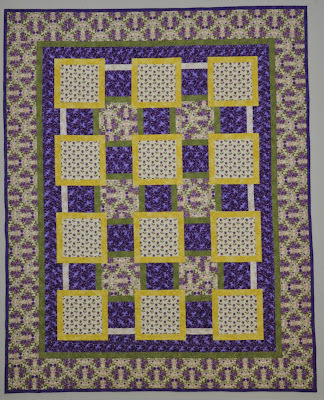 This fall, I have started inserting my own projects between customer quilts so that I can move my own projects forward. This plan seems to be working so far. This picture was taken Friday night and it is a top made from strings foundation pieced onto dryer sheets that I finished piecing August 1st. I am also working on the binding on my Daffodil BQ2 quilt. I only have one corner of the quilt’s binding hand sewn to the back of the quilt so far. If I am looking for a handwork project this is the one I can pick up. These are the fabrics that I recently purchased to start a new project. I fell in love with the floral fabric and coordinating stripe. The light green fabric in the middle will be used as background–a departure from the usual white or off white background that I usually gravitate to in a project. These fabrics will be used to make a Terry Atkinson pattern, “Got Stripes?” from Terry’s new book, “Time Out Quilts”. I work on the reward system to stay motivated as I work through some of my UFO’s. The reward for working on a UFO or other challenging project is to work on something new. Working on Got Stripes will be the reward for the next while. Having several projects at various stages of the process also helps to keep things moving forward. 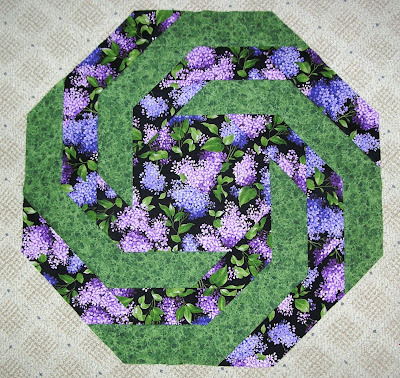 If I feel like piecing or quilting, or doing handwork, I have something ready to go. I spent today piecing two new flimsies. Both tops are made from the pansy collection of fabrics I purchased in Oregon when I was there over a year ago. This fabric seems to go on forever as I continue to piece projects from it in an attempt to use it up. This first flimsy is a table topper. 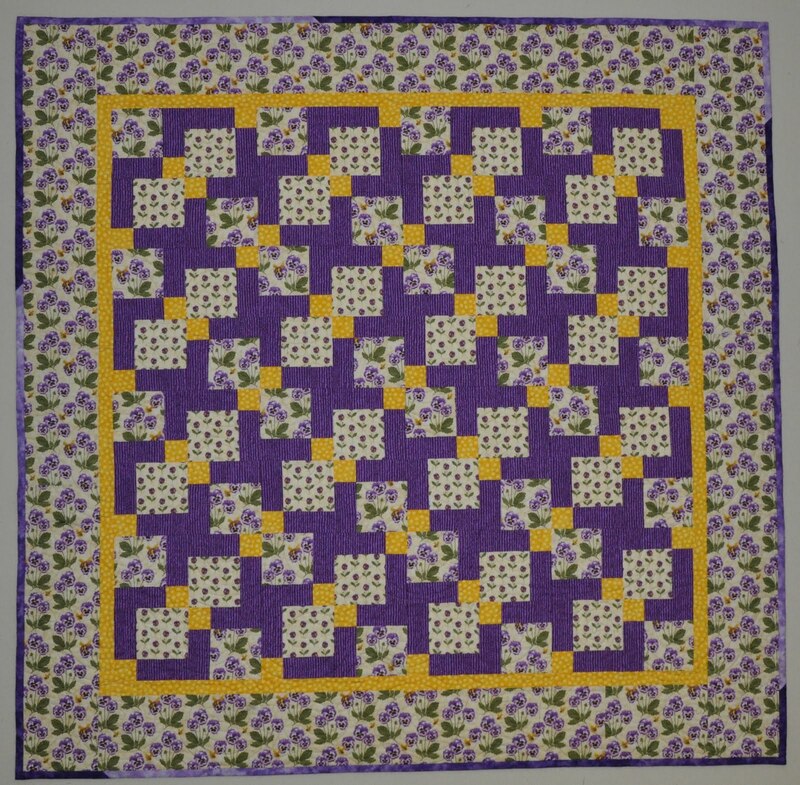 I made this one from 2 1/2″ strips instead of the usual 3″ strips. This one finishes at about 27″ across. The purple fabric on the outer edge really looks blue in this picture. This next flimsy is a table runner from Terry Atkinson’s book, Let’s Do Lunch. This one finishes at 16 1/2″ x 66″ – nice and long. Terry calls this one Seven Layer Salad. 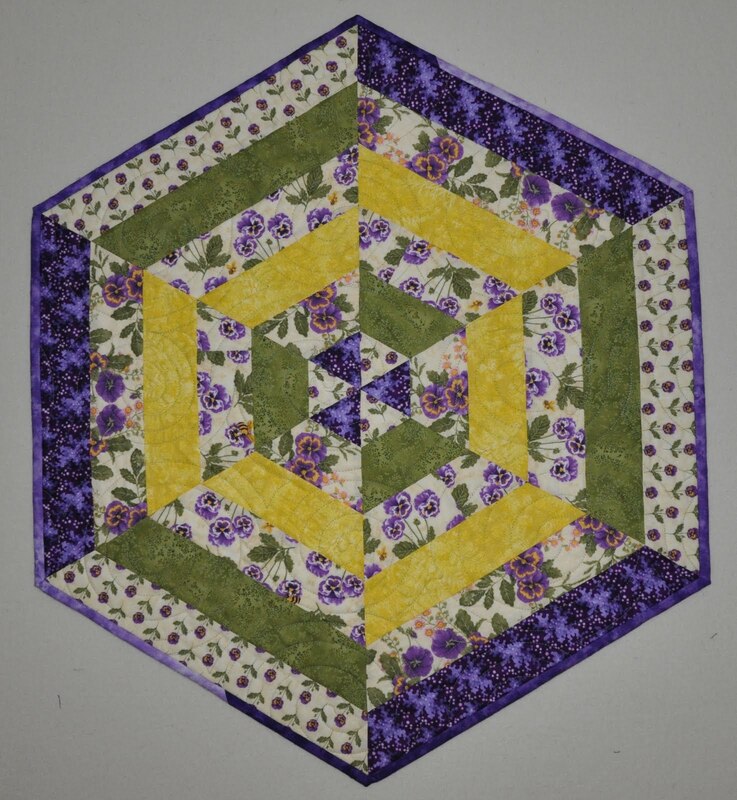 Even after piecing these two tops, I still have more of this pansy collection left! 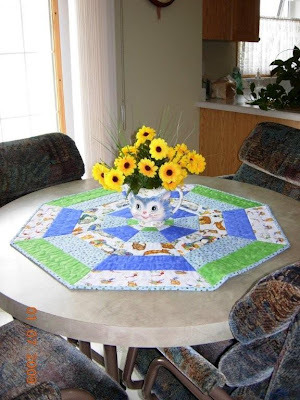 The cat table topper that I made for my aunt has reached its destination. Here is a picture of the table topper on my Aunt’s table. Have a look at the cute flower arrangement that she and my mom put together to go with the topper. 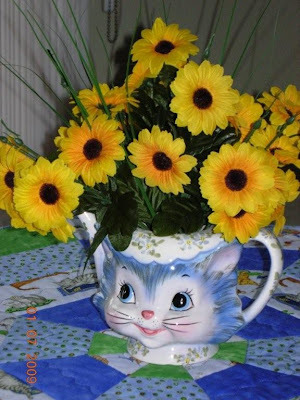 The cute cat tea pot was already in the possession of my aunt. My mom got the idea to put some flowers in it and use it as a centerpiece. Very cute! As a thank you for making the toppers for her, my aunt gave me this addorable pewter pin. I have always admired the sewing/quilting themed pewtewr pins that some of my fellow guild members have. Now I have one of my own. 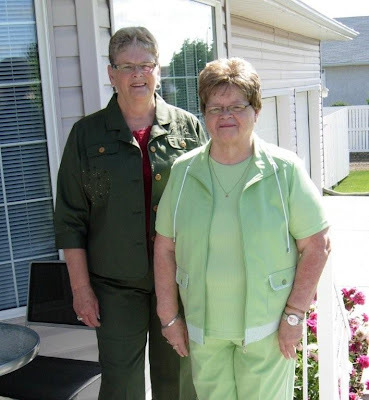 And because I have been talking about them, this is an updated picture of my Mom (left) and my Aunt (right). Looks like the weather is sunny at my Aunt’s house. 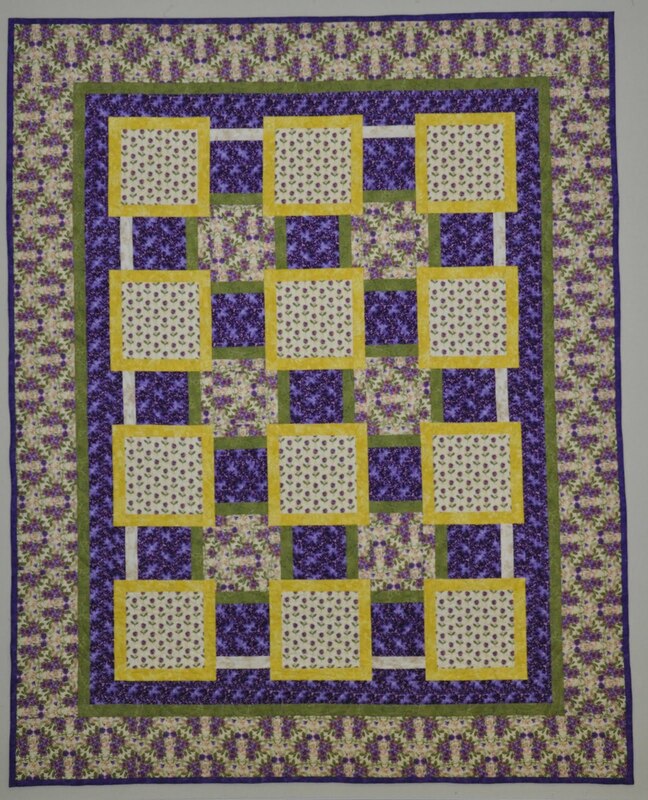 Hopefully, it won’t take me another year to get this one quilted for myself! The colours don’t photograph as true as they are in real life. The purple in the lilacs is looking a little blue–you will have to take my word for it–those lilacs are really purple! I can tell you with certainty that I will never be making this pattern again! I am fed up with 60 degree angles, templates, and trying to get things to match up where they are supposed to. Some patterns are better left on the designer’s studio floor and should never make it to the cute little plastic bag hanging on the hook in the quilt shop stage. Don’t get me wrong, some designers know how to design and publish great patterns. One designer in particular who you can trust is Terry Atkinson of Atkinson Designs. 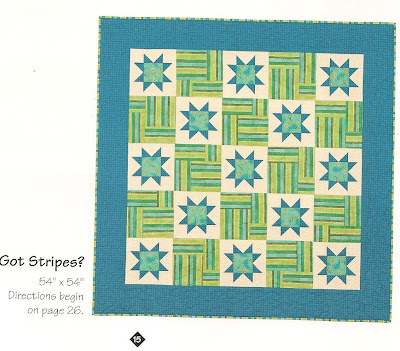 Terry tests her patterns before publication on “real quilters”. IMHO, this is a designer that not only knows what she is doing, but is interested in repeat sales of new designs and patterns to quilters who have previously purchased her products. I started the first triangle piece of this topper in the morning, got so frustrated with the piecing technique described in the pattern and quickly abandoned the project for the day. As I hate to waste anything, I headed back down to the studio in the evening and decided that IIWII (it is what it is) and I finished it. So, here it is with all its imperfections. I am sure once it is quilted I will be able to find a home for it. 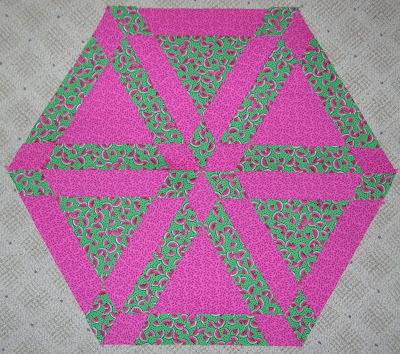 Lucky for me I have fabric leftover and I can make another topper in a “friendlier” pattern. Come to think of it, I should add IIWII to my bucket list and then I can strike two things off the list!